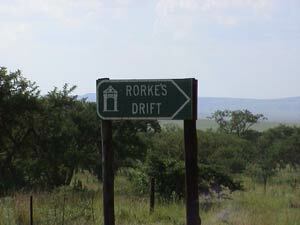 On Thursday 18th January, 2001, Matt Chambers, Alan Critchley and myself - Peter Critchley, set off to South Africa on a pilgrimage of sorts to visit Rorke's Drift. We didn't bargain for the whole host of bonuses that we would receive on this fantastic trip. I have tried to cover as much of the trip as I can without boring you, and I have broken each day down, to allow the pictures to make more sense. Start at the beginning by clicking on the "Friday 19th January" link, and follow the links at the bottom of each page. Alternatively, if you are impatient, you can jump straight into the other pages by clicking on their dates. We didn't visit all the sites on exactly the same days as the battles, but this was more due to the need to tie in with the guide's timetables than anything else. You will see a brief description of what we did on each day underneath each link. There is also a large amount of video which has yet to be edited. There are a number of plans as regards to this, but if you would be interested in a copy, please mail me. NOTE: Some of these pages have quite a few images on them. The plain document is also available, click here if necessary, but I recommend that you wait to view the pictures!